United.com is the fastest way to search most Star Alliance award space. I frequently use the search engine even if I’m using another type of Star Alliance miles. Yesterday I uncovered a problem with searching for United flights only. On united.com, click Nonstop if you want the search results calendar to display nonstop flights only. If you want to see only United flights, click “All search options” in the bottom left corner of the search box on United’s homepage…. …where you will be directed to an advanced search page. In the locations and dates section, clicking My search preferences triggers a drop down menu. Clicking “United and United Express® only” puts a filter on the search that should leave out any partner flights. Right now the “nonstop” filter is working but not the United-only filter. Yesterday I discovered a malfunction in the United-only filter when running some searches for United award space to Europe. Putting the United-only filter on my searches was yielding calendars that reflected results with partner flights as well. I know this because the list of flights available for the specific day searched, listed underneath the calendar, were not showing the Saver space that was reflected in the calendar’s color coding (green = Saver Economy and Saver premium cabins available, blue = Saver premium cabin available). The United-only filtered calendars were matching the non-filtered searches, which should not be the case. Simple logic tells us there should be fewer United flights available than United and Partner flights available. This means you’ll need to search day-by-day to check if the Saver space you want is actually available on United metal until a software tester at United figures out the bug. Below are search results on different routes that illustrate and prove what I’m talking about. Despite my request for the second calendar to filter any partner flights and only leave United flights, it is the same as the first. The flights available for May 1 (the day selected on the calendar here) displayed under this calendar did not show any Saver space available in Business or First Class which is what the green color is supposed to symbolize. The calendars are the same. And the flights available for May 1 (the day selected on the calendar here) displayed under the calendar did not show any Saver space available in Business or First Class, which contradicts the green shading. Here are two other routes that exemplify the same problem. These calendars are for two passengers traveling from Houston to Paris, unfiltered, showing all United and partner flights. The calendars for the same route during the same two months, but filtered to only show United flights and not any partners, are exactly the same. Flights listed underneath were not reflective of this Saver space. These calendars are for two passengers traveling from Washington, D.C. to London, unfiltered, showing all United and partner flights. I also noticed another small malfunction, although this one isn’t nearly as annoying as the United-only filter glitch as there are two simple ways to work around it. The Nonstop box in the search tool on United’s home page and the “New Show only nonstop flight availability” check box on the search results page don’t fully work. Checking either will update availability on the calendar (i.e. the colors change) but the actual flights available listed under the calendar don’t update. Un-check the 1 stop box on the left hand side of search results page. This will update the flights listed under the calendar. 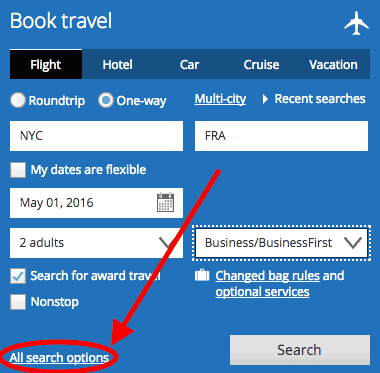 United.com‘s search tool is buggy at the moment, so if you’re trying to find United flights to book with United miles and would like to see more than a day’s availability at a time, you’ll need to pay for it on a site like Award Nexus– read more here about how to use it. I will keep an eye on the situation and let you know when it appears that the bug has been resolved. Likewise, let us know in the comments if you see any progress. Next articleDo American’s Post-Devaluation Sweet Spots Have Award Space? These Four Do!